The Joyful Sound Choir is preparing for its annual Christmas program on Saturday December 17, 2016 at 6:00 pm. They will be joined by the children from the Junior Church program to present Jesus, the Birth - Jesus, the Salvation. An updated church directory is in the works and it needs you! 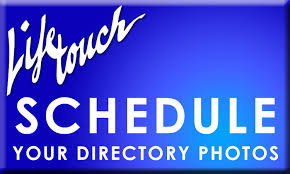 Lifetouch has been chosen to take family and individual portraits and publish the directories. Appointment slots are scheduled for January 5-7, 2017. Families are asked to use the button below to visit the secure site set up exclusively for Crossroads to select a portrait appointment. You will asked to indicate the number of persons in your group, reserve an appointment time, and then complete some contact information. See Barb Knauff for more information. Beginning Sunday January 8, 2017 Crossroads will be presenting a new Sunday School program for school age children. Creation to Christ (C2C) The Foundation Blocks of the Bible is based on a highly respected and effective curriculum developed by New Tribes Mission for the mission field that teaches the Bible chronologically, from the beginning. Sessions will be every Sunday morning starting at 8:45 am. Classes are available for 1st grade children and up. Adult classes will also be conducted. Nursery service will be provided. Transportation will be available, if needed. A free kick-off event will be held on Sunday November 20, 2016. An afternoon of fun is planned at The Olympic Fun Center in Hermitage. Entry, food, drink, and transportation will be provided. Kids can be dropped off the church at 1:15 pm and will return to the church at 5:00 pm. Permission forms will need to be submitted. A team of volunteers is being assembled to oversee this project. If you would like to be involved or have questions, see Dave Ruhl or Pete Keeley. A hike for married couples has been planned for Sunday June 12, 2016 at McConnells Mill State Park. This won't be a cozy stroll down lovers' lane; the Slippery Rock Creek Gorge has rugged trails and steep climbs, scenic rock formations, and several beautiful waterfalls that are only accessible from the trails. We will leave Crossroads immediately after the morning Worship Service, picnic lunch at the park (ice cold water bottles will be provided), and then enjoy fellowshipping together on the trails. Sturdy hiking boots and a walking stick are recommended. Bring a picnic lunch for yourselves. Please sign up if you are interested. Carpooling is encouraged. Are You Feeling the Tug for a Mission Trip? Do you want to go on a mission trip? During the week of January 21-28, 2017, Todd Jaussen has been asked to be the Devotions Leader for a trip sponsored by Meeting God in Missions. During that trip, MGM will be building a new school building for the Deaf School at Hato Mayor in the Dominican Republic. They are in need of construction workers. Todd and Jan Jaussen will be doing ministry among the pastors and the villages at that time as well. If you have any questions, please ask Todd or Jan Jaussen or Paul Sereda. We are planning an All Daughters' Tea for Saturday May 21, 2016 from 1:00-3:30 pm at the church. Women and girls of all ages are welcome. Ladies, please sign up and provide the total number you will be bringing, including yourself. A Ladies Game Night for all women of the church will be held at Fresh Grounds Coffeehouse from 6:30 pm until 8:30 pm on Monday March 7, 2016. This will be a relaxed evening of fun and opportunity to spend time with each other. Bring a beverage for yourself as the shop will not be open. Contact Martha Johnson if you have questions. For the 2016 Clothing Drive, each month with concentrate on a different need. Totes are available to collect the donations. All undergarments must be new and in original packaging. Direct any questions to Debbie Weese. Do You have a Heart for Missions? The Missions Committee is seeking one or two missions-minded individuals to join their team. This committee oversees Crossroads' outreach to local and global mission interests. If you have a heart for missions and believe the Lord is leading you to serve in this area, please contact Paul Sereda. The spring 2016 semester of the Grace School of Ministry is set to begin Wednesday January 13, 2016. Classes will be held on alternating Wednesdays through May 18April 20, 2016. Todd Jaussen is starting a new course at 7:156:00 pm on Proclaiming God's Word. "How shall they hear without a preacher?" One of the greatest needs of our day is for biblical, passionate, clear preaching. The church, our nation, and the small towns and villages of our region are languishing from the lack of good preaching. Where must people go to hear the Word of God opened up with power and ability? Is the internet now as the only option? But internet preaching is not live preaching from a man of God whom you know and who is a role model for you in all of life. Our vision is to raise up an army of preachers who will be sent out into our area and bring the Word of God to the people who are in darkness. At 6:007:20 pm Scott Graubard will be continuing the course on Biblical Counseling and will be dealing with practical case studies. Course materials and lectures will continue to be available on this website. Want to experience marriage the way God intended? Then why not try some love and respect? For more information or to register call (724) 588-4454.